Charlie spent years as a stay-at-home dad. He loved getting to spend every day with his daughters. He enjoyed taking care of them and teaching them. But some people in Charlie’s community looked down on him for this. They said that he should be busy providing for his family instead of raising strong daughters. Troubled, Charlie sought advice from an elderly friend. His friend shared Luke 18:15-17 with him. If you’re not familiar with that passage, it was another busy day in ministry. People were swarming Jesus, and His disciples were attempting to make sense of the chaos. Maybe that’s why the disciples wanted to send away the little children. They even went so far as to rebuke the parents who brought them (Luke 18:15). But while they were busy doing that, they totally missed Jesus’ heart for little ones. Jesus made time for the children, welcoming them to come to Him. He didn’t mind listening to the coos of a baby or kissing a “boo-boo” on the knee of a toddler. He celebrated children and loved on them. 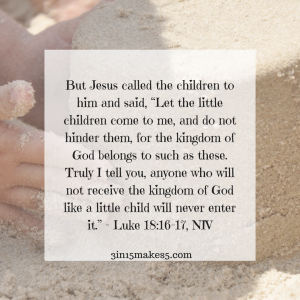 God, when I’m tempted to dismiss children or parents who are raising them, let me remember the story of Luke 18. I want to embrace kids and parents with the same joy and kindness that Jesus did. In Jesus’ name, Amen. Next post: Social Anxiety: Is It a Personality Disorder?